The Visual Information Specialist at my previous facility in Erie, Pennsylvania is currently serving in a year-long military deployment. In his absence, the medical center has been without dedicated design, photography or web support. Knowing that would make the VISN requirement for an annual report difficult for them, I reached out to my former colleague there Public Affairs Officer Sarah Gudgeon to offer to design their Annual Report. Using Adobe Creative Cloud she was able to share photos and the story content with me to incorporate into the layout. Erie, Pennsylvania is a port city of historical significance from the War of 1812 and is home to the flagship Niagara. The previous logo for the facility was a pointillism drawing of the ship, and in 2009 was modernized and simplified into a red and blue nautical star. 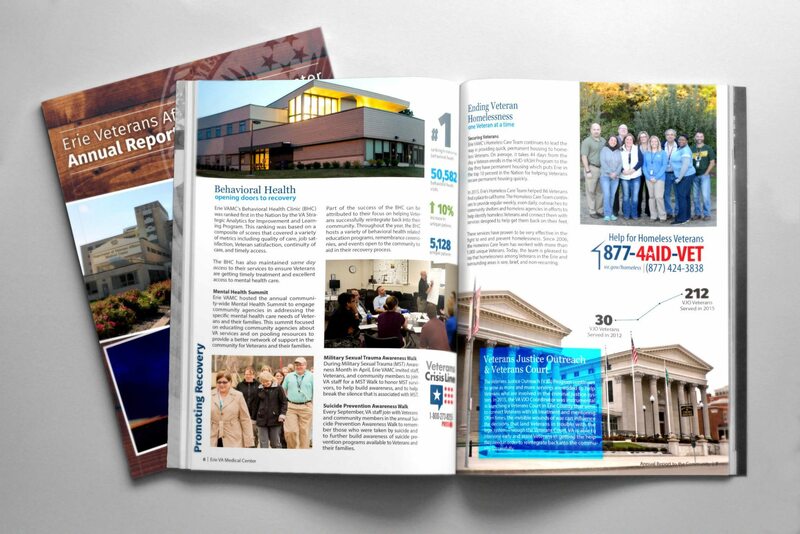 For the cover of the annual report I wanted to highlight the community that the VA serves through both the hewn wood background and various snapshots of community landmarks and figures. This 12-page report is more traditional with an emphasis on data and short achievement highlights with supporting photography. The finished product is distributed online through the Erie VAMC’s news page and throughout the VISN 4 network. It is anticipated there will also soon be a limited print run procured through GPO to have copies placed in the facility’s various clinics and distributed to key stakeholders. The layout was highly praised by the Public Affairs Officer, the Erie VAMC executive leadership team and the VISN 4 Communications Manager.